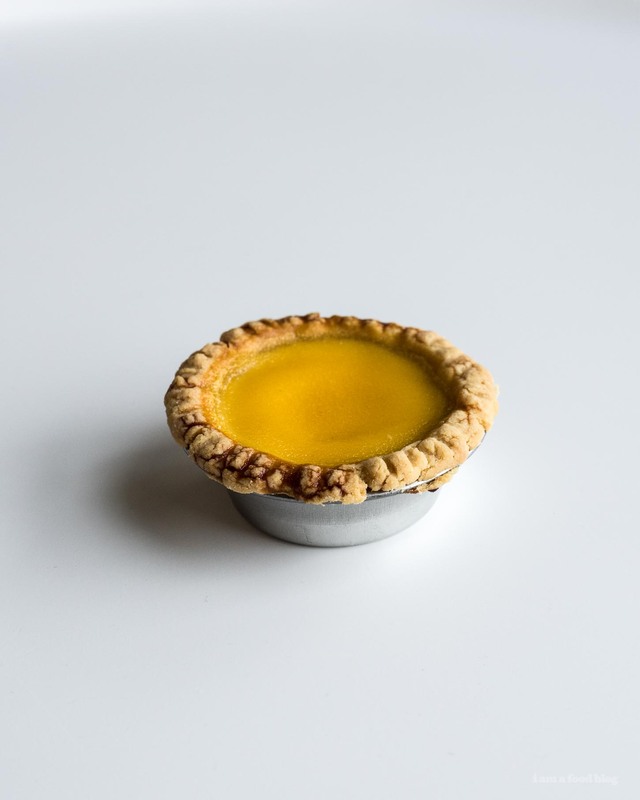 Hong Kong style egg tarts are my favorite: cheerful yellow creamy egg custard in a shortbread cookie tart shell. 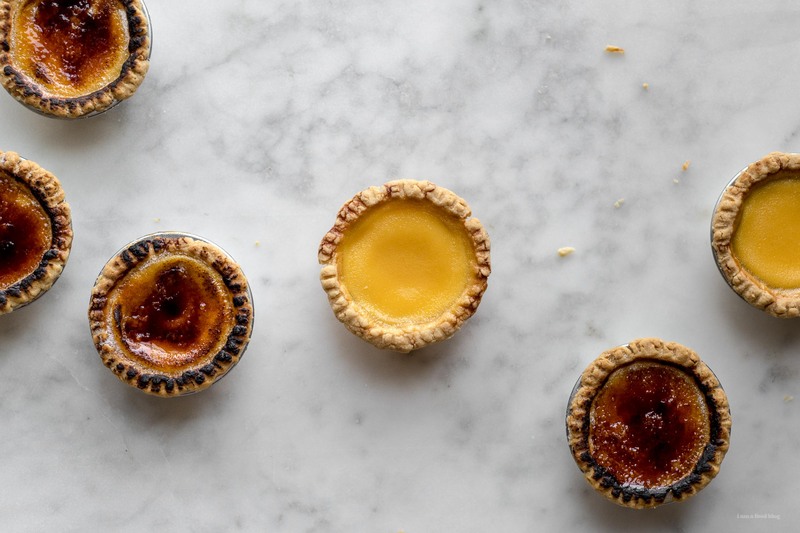 Skip the bakery and make these egg tarts at home. Do you ever pass by a Chinese bakery and are enticed in by the delicious smells wafting out the door? 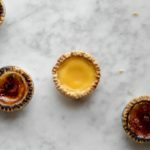 For me, what gets me every times is the tray of Hong Kong style egg tarts – cheerfully golden yellow egg custard in a crisp shortbread shell. Or, even better, when you’re at dim sum and you order a fresh plate so they’re warm and custardy and all the good things in life wrapped up in one handheld treat. When I was a little kid, all I ever wanted to do was eat the insides, no tart shell please. My mom used to get SO MAD at me. I’d scoop out the insides and leave the tart shell behind. But…sometimes my my brother would want to eat the outsides only so it was kind of sort of okay? Other times she’d eat the outsides herself, grumbling all the way. Anyway, I guess I’m still kind of a spoiled brat because I still only want to eat the insides. Even so, I did the adult thing and made tart shells and baked these guys off. It was surprisingly easy to make the egg custard part (the good part) and not so surprisingly, the tart shell was just a touch annoying. Every time I bake I am reminded why I don’t consider myself a baker. The shells weren’t hard to work with, per se – they were just annoying and fiddly. I made it worse for myself by deciding to make a giant egg tart in one of those rectangular tart pans. I thought I was being brilliant because bigger pan meant more filling, but in the end, it didn’t quite work out because I didn’t dock the pastry. 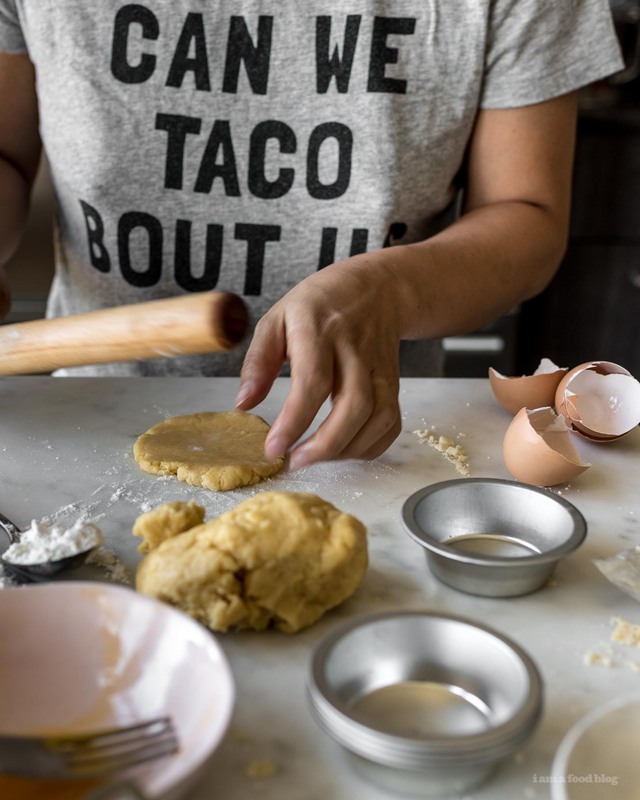 Docking pastry –for those of you won’t don’t consider yourselves bakers, like me– is when you poke holes in the pastry to prevent it from bubbling up and cooking unevenly. I didn’t dock and the giant tart cooked in a very weird way. In the end it didn’t matter because I ended up only eating the insides, hee hee. The smaller egg tarts, on the other hand, turned out perfectly. Sunshine-y yellow golden custard with crisp cookie shells. I brûléed some of them because I’m obsessed with our kitchen torch and the crisp contrast of caramelized sugar and creamy custard was out of this world. 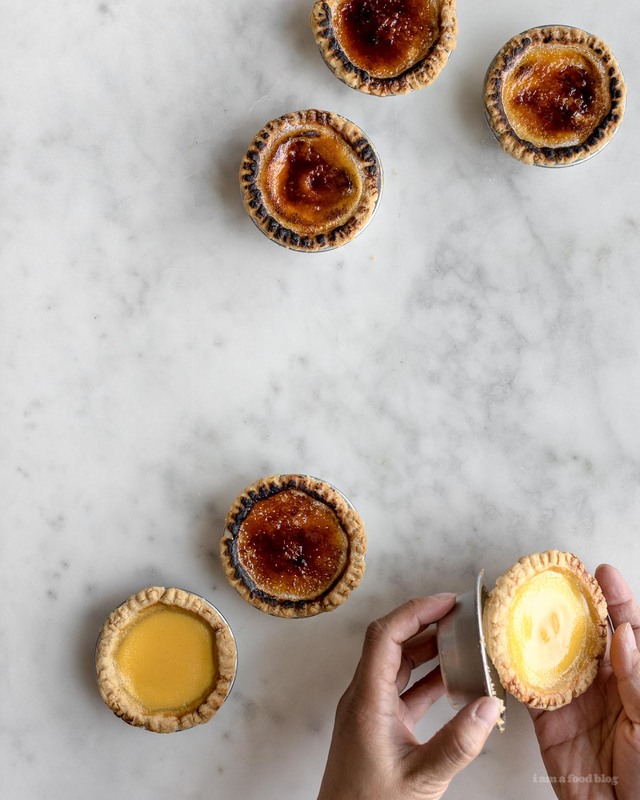 Even better than Portuguese egg tarts! PS – I’m totally going to make these again, sans shell because the filling is where it’s at! I doubled the recipe so I could make the giant tart, but the original is just for 6 egg tarts, which I think is the perfect amount to make at home. Enough so you feel like you have a couple of extra, but not so many that you’re drowning in tarts. Cream together the butter and icing sugar until light and fluffy. Mix in the eggs and then the flour and salt. Lightly knead until it forms a ball. Wrap in plastic wrap and place in the fridge to firm up, 10-15 minutes. Divide the dough into 6 equal pieces (I weighed out the dough then divided into 6, it’s about 38 grams or so). Roll the dough into balls and flatten with a rolling pin. Place in the middle of the tart pans and press evenly. Use a fork to press the edges down, if preferred. Refrigerate for 30 minutes, or overnight. Mix together the water and sugar, until dissolved. Set aside and let cool. While the simple syrup is cooling, lightly beat the eggs. Beat in the milk, vanilla, and salt. Add the simple syrup, mixing well. Strain through a fine mesh strainer, twice to ensure a silky smooth filling. 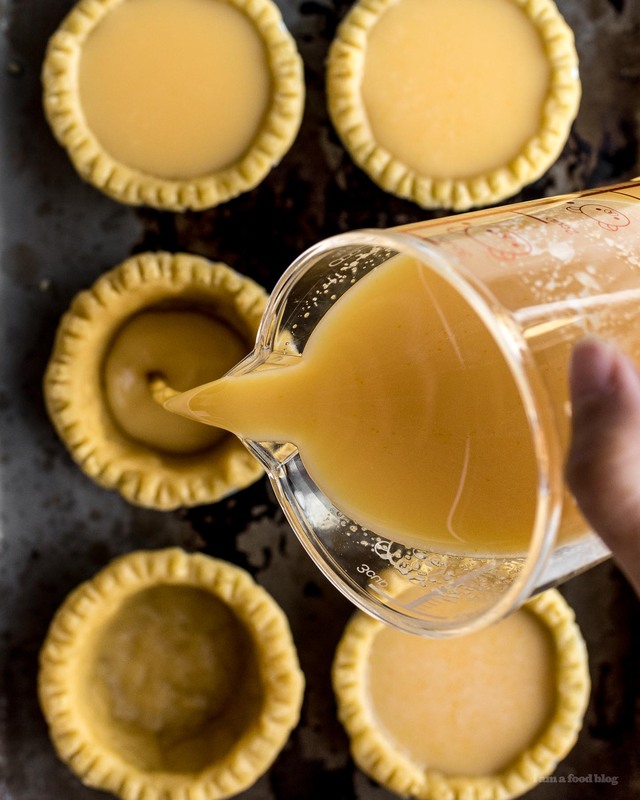 Pour the egg mix into the tart shells and bake for 10 to 15 minutes, or until the edges of the tarts are lightly browned. 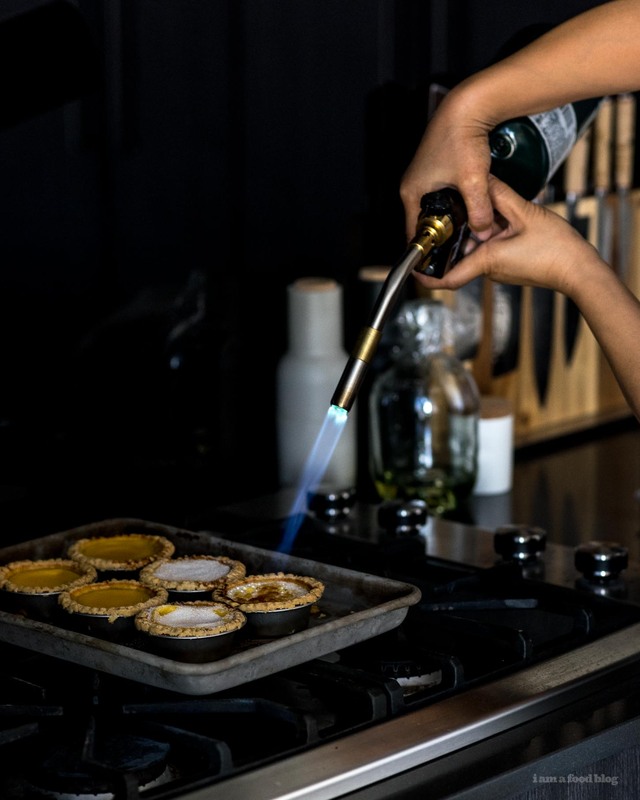 Turn the oven down to 356°F and continue to bake for another 10 to 15 minutes, keeping an eye on the tarts. If the filling starts to puff up, open the oven door slightly to prevent the custard from becoming too hot and collapsing. Test the custard doneness by poking a toothpick in the centre. If it can stand on it’s own, it’s done. Remove and let cool. Enjoy warm, room temperature, or cold. Hi, they look delicious! Can I use regular sugar instead of icing sugar for the dough? Also, you mentioned docking the pastry – for the smaller/regular size tarts, do I need to dock the bottoms before I pour in the filling? you have to use powdered sugar to give it that shortbread/melting kind of feel. i didn’t dock the little tarts and they worked out fine! Fantastic recipe! Really love your blog and pictures! Beautiful!! The words shortbread crust and custard tart should always be said in the same sentence!! YUM! These look so good. I’m always so nervous about the torching step, but that final bit of caramelization makes such a huge difference!! custard tarts are where it’s at!! It never even occurred to me to make these at home! I just always figured I could only get them when we went to dim sum or Chinatown. Game changer! heehee yup! they’re pretty easy to make too! and if you want a shortcut, you can even use those pre-made tart shells they have at the grocery store! Oh god, that bruleed top is really calling out to me. And the pastry looks incredibly neat!